Sansepolcro is a town nestled at the foot of the Apennine Mountains, a gateway to Tuscany that rules the Upper Tiber Valley. This sprawling green mountainous terrain skims the Alpe della Luna and the Massa Trabaria area, bordering Umbrian hills, the mountains of Arezzo and the Catenaia Alps. Legend has it that Sansepolcro’s mystic origins trace back to the pilgrim saints Arcano and Egidio. They came to this valley while traveling back from the Holy Land, where a divine sign led them to build a small chapel to house the sacred relics they carried. The town lived a golden age from the 1300s to the 1500s. Today, Sansepolcro’s picturesque historical center remains proof of this period of art, culture and commerce. Impressive city walls surround the center of Sansepolcro, featuring gun embrasures by Bernardo Buontalenti and the Fortress of Giuliano da San Gallo. Home to medieval palaces, Renaissance towers and frescoed churches, the town gives off an authentic, traditional vibe, tying it back to one of its most important historical figures: Piero della Francesca. The artist, who also signed his work as Pietro dal Borgo, celebrated his hometown as the “ideal city” in many of his works, a hot topic in Italian courts at the time. Besides Piero, don’t forget other famous artists from Sansepolcro, including Raffaellino dal Colle, Cristoforo Gherardi, Remigio and Marcantonio Cantagallina, not to mention the many artists of the Alberti and Santi di Tito families. 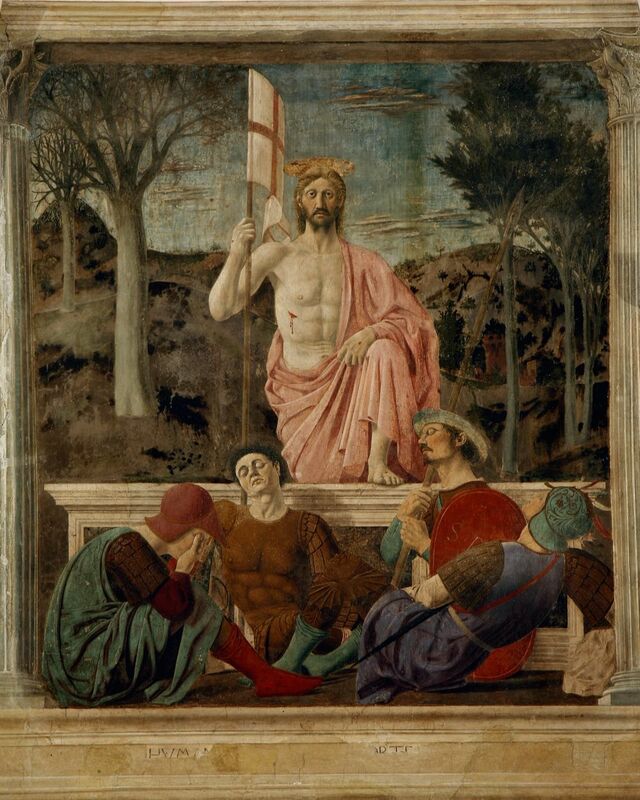 Don’t miss the Civic Museum, where you’ll find Piero della Francesca’s Resurrection and Polyptych of the Misericordia. Be sure to check out the Aboca Museum or the Bernardini Fatti Museum, a museum on glass windows, and in Sansepolcro Cathedral, the Volto Santo, a wooden crucifix from the Carolingian era. Other churches worth visiting are Santa Marta, Santa Maria delle Grazie, San Francesco, San Rocco and Sant’Antonio Abate. These sites, not to mention the Medicean Fortress and Piero della Francesca’s house museum, make Sansepolcro the perfect destination for art enthusiasts. Sansepolcro is also home to the Palio della Balestra and Flag Games, celebrated in honor of Saint Egidio. On the second Sunday in September, archers prepare to face their age-old rivals of Gubbio in this epic crossbow tournament. Residents dress in Renaissance costumes, made according to the frescoes of Piero della Francesca, and fill Piazza Torre di Berta to the sound of beating drums and singing trumpets. Besides the Palio, you can also check out the Goldsmith Art and Lace Biennials, events that spotlight two ancient forms of local craftsmanship. Lastly, be sure not to miss a chance to relive the Renaissance through your taste buds: check out the Renaissance dinner held in the evocative Cloister of Santa Chiara, hosted by the Rinascimento nel Borgo association and the Convivio Rinascimentale.